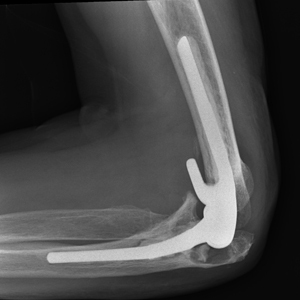 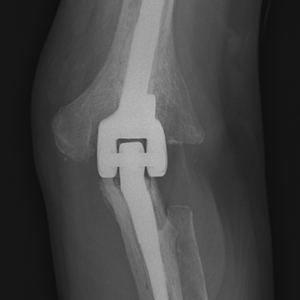 This patient with severe rheumatoid artritis underwent total elbow replacement with a good outcome. 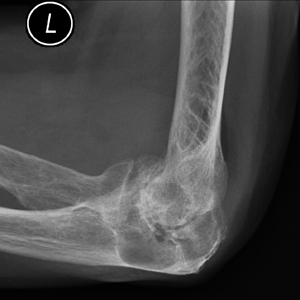 This patient presented to me with instability symptoms in his elbow. 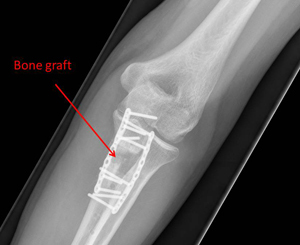 He previously had treatment elsewhere for a Monteggia-type fracture-dislocation of the elbow with plate fixation of a fracture of the ulna. 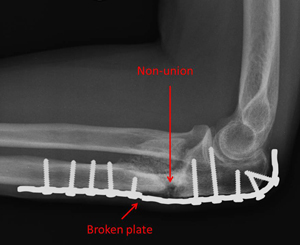 New x-rays showed that the plate had broken and a subsequent CT scan confirmed that the fracture had not healed. 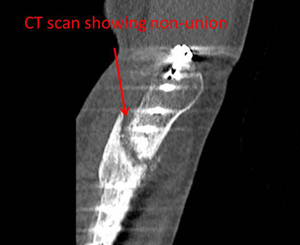 Under general anaesthetic the broken plate was removed, then the non-union site excised and stabilised with 2 Titanium plates. 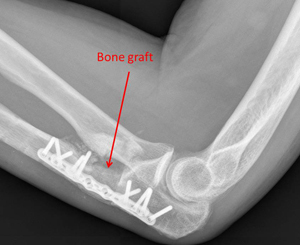 The bone graft went on to unite successfully and the patients instability symptoms disappeared.